KICKOUT FLASHINGS - STO CORP. STUCCO MFR. Sto Corp. is one of the largest stucco manufacturers in the U.S.A. and they have a website full of great information. They also have a large library of installation details on their website. Their site can be found at http://www.stocorp.com. 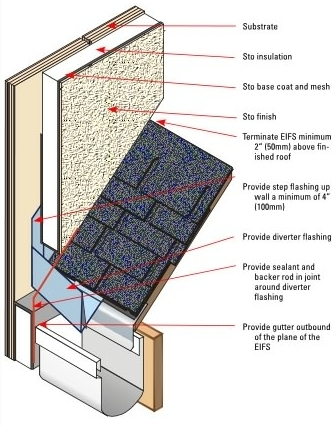 Specifically, the Sto details 5.62 and 2.62 (see below) clearly show the kickout flashing and how it should be installed with both traditional stucco and EIFS synthetic stucco systems. 1] Provide step flashing minimum 4“ (100 mm) extending up the wall. 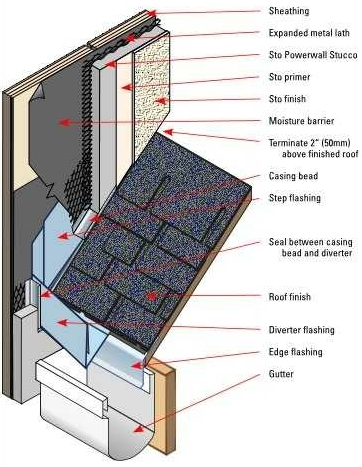 2] Provide stucco overlap of the step flashing 2” (50mm) and terminate stucco minimum 2“ (50 mm) above the finished roof. The space permits re-roofing at a future date and helps prevent debris from accumulating between roof and stucco. 3] Terminate the step flashing with a watertight diverter (kick-out) flashing to direct water into the gutter. Refer to Sto detail 2.62b on fabrication of a diverter flashing. 4] Provide a 3/8” (10 mm) joint around the diverter flashing and seal. 1] Detail shows one method of field fabricating a diverter flashing . 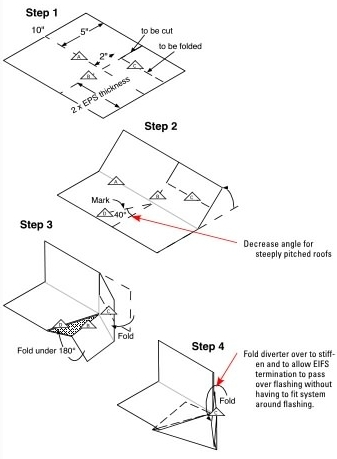 Adjust angle based on pitch of roof. Refer to Sto detail 2.62a for installation. 1] Provide step flashing minimum 4“ (100mm) extending up the wall. 2] Provide EIFS overlap of the step flashing 2” (50mm) and terminate EIFS minimum 2“ (50mm) above the finished roof. The space permits re-roofing at a future date and helps prevent debris from accumulating between roof and EIFS. 3] Terminate the step flashing with a water-tight diverter (kick-out) flashing to direct water into the gutter. Refer to Sto detail 2.62b on fabrication of a diverter flashing. 4] Provide a 1/2” (13mm) joint around the diverted flashing and seal with sealant and backer-rod. The above detail is a good illustration for the kickout flashing, but poor for the 2” above roof termination described in step 2 above.